The PNG Acting Government Chief Secretary, Frank Aisi, says the PNG Defence Force's naval element is already on the Schouten Islands, to assist evacuate the Kadovar islanders from the Ruprup Island to Turubu on the Wewak mainland. Mr Aisi also says a K15,000 relief funding is being mobilized in consultation with the East Sepik Governor, Allan Bird, to purchase immediate supplies for the people. 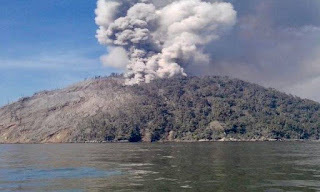 Scientists at the Rabaul Volcano Observatory, say the spewing of smoke and ash on Friday, has covered the entire island, making it unfit for occupation. Volcanologists also say while Friday's eruption was only a discharge of old material from the volcano, it could be disastrous if the magma reaches the surface. The volcano observatory also says Kadovar islanders may not be able to return to their island in a long while. Mr Aisi says, prime minister Peter O'Neill has directed relevant disaster and emergency organizations to work together help and resource the islanders from the disaster. "So that's what the prime minister has done. He's also directed all relevant agencies work closely with the National Disaster Office and East Sepik Provincial Government and other agencies to ensure the islanders are safely evacuated to safer grounds. "The Defence Force is already there, to assist with logistical requirements. "The Rabaul Volcano Observatory is also being instructed to monitor the situation on the island as well as on nearby islands. "We already secured the funding and we need to procure the goods from services providers in Wewak town. We will arrange funding to Papindo in Wewak to purchase fresh water and food which are the immediate requirements." Frank Aisi is the Deputy Secretary Policy 1, responsible for Economic, Infrastructure and International Relations with the Department of the Prime Minister and National Executive Council. He's currently the acting government chief secretary in the absence of Isaac Lupari. Mr Aisi says government agencies responsible for disaster warnings and emergencies should be grouped together in order to respond effectively to events in the country. The vital disaster warning and emergency agencies are the Rabaul Volcano Observatory which comes under the Geohazards Division, located within the Department of Mining, the National Weather Service which is housed under the Department of Transport, and the National Disaster Office which operates from the Department of Provincial and Local Level Government. Mr Aisi told NBC News, he's concerned with the scattering of the agencies and their effective and coordinated actions.